Amanda & Eric got engaged on a rainy evening in Disney World, so when I called Amanda on the morning of their engagement session to warn her about the forecasted rain that afternoon, she was unfazed. 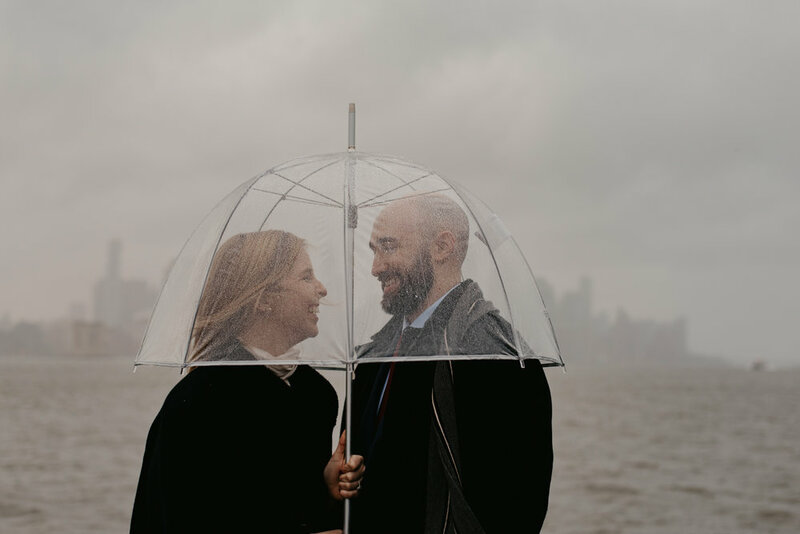 She shared their engagement story and said it only felt fitting that it also rained during their engagement session. They were up for making some romance in the rain, and the resulting photos were pretty magical. 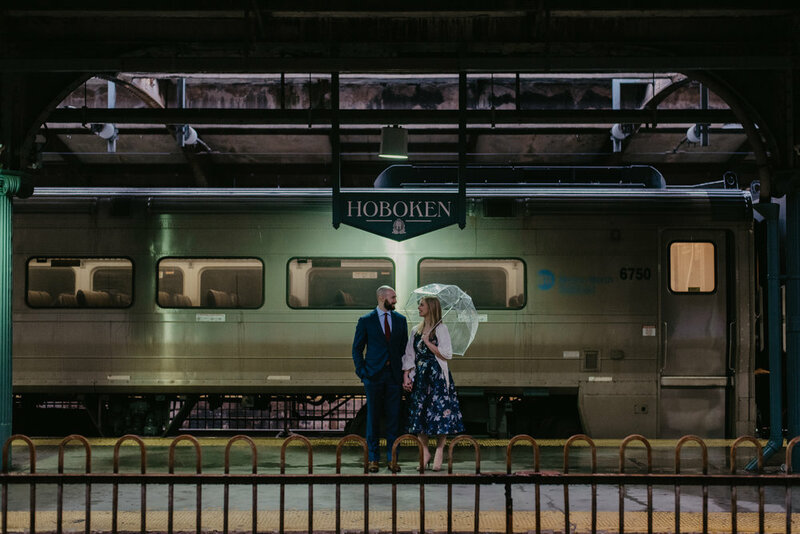 We spent some time shooting on the Hoboken train terminal platform, in the train terminal, and on Pier A. While we were on the train platform, I was snapping shots of Amanda and Eric walking along an empty train track when the train to the left of them in the photos below began to pull into the station. I had a mini-panic attack because this train was blocking almost all natural light that was streaming onto the platform. However, I ended up loving this look and running with it. I’m glad I didn’t give up and stuck around to see what the frame looked like with two trains in the shot — they created shadows and highlights in just the right places for a more dramatic effect. Sometimes you just have to trust yourself and create your art, otherwise you might miss out on some magic. I had the pleasure of capturing some sweet engagement moments between two dear friends — Emily & Tim. Emily was my little sister’s freshman roommate at Penn State, so I’ve known her for almost eight years. When she and Tim moved to Brooklyn, we made plans for regular double dates & get togethers around NYC. When Tim popped the question and they asked if I’d photograph their engagement session, obviously I was over the moon. I was absolutely honored when Jess & Brandon asked me to photograph their rehearsal dinner. Matt and I had planned a weekend away in Newport, RI, to attend their nautical wedding, so I gladly added my camera gear to my packing list. Jess & Brandon have a magical love story (read more about it in their engagement blog here), so I couldn't wait to capture part of this next chapter of their lives together. Jenna & Dirk met in Hoboken and have been dating in the Mile Square City for the past four years. When they're not having breakfast at Schnackenberg's or out for dinner at La Isla, they like to walk along the waterfront and kick back with some drinks at Pier 13. They also like to take weekend trips to Long Beach Island, but also enjoy staying in, ordering food, and cuddling up with a movie together. Daniela and her sister Yvonne wanted to celebrate their mother Senka’s birthday by capturing some family moments at a location that has significant meaning to their family. Their father Ivan worked most of his life as a bridge painter. He worked on several of the metropolitan area bridges throughout his career. His last project before retiring was painting the George Washington Bridge. One week ago today, David asked Ashley to spend forever with him. He held her hand as he led her down Pier A on a sunny Saturday morning. They stopped at the end of the pier, where incredible views of the Manhattan skyline surrounded them. David took Ashley's hands, looked her in the eyes, and said a few sweet sentences to her before he dropped down on one knee and popped the question. Of course, she said yes! Then David slipped a beautiful new piece of jewelry on her left ring finger and kissed her. Pretty perfect, right? Jen & Rob exchanged vows just five months ago on a winter night in Florham Park, NJ. Fast forward to today, and they're living newlywed life here in the Mile Square City, where their love story began. 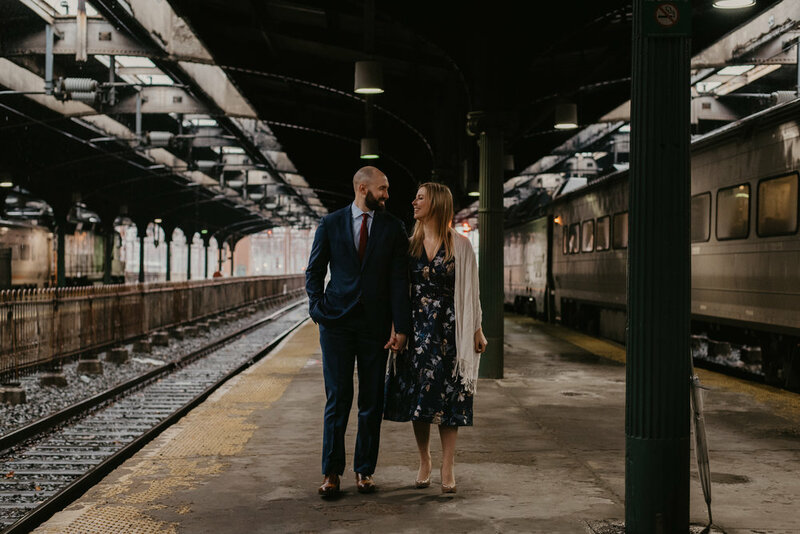 Keep reading to learn more about this incredible couple, including their favorite Hoboken spots and their best piece of newlywed advice. 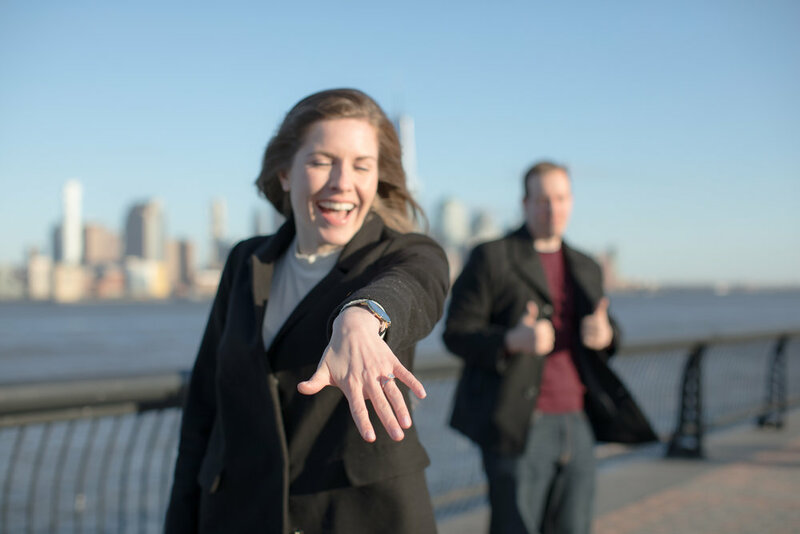 Rebecca & Dan met in the Mile Square City while attending the Stevens Institute of Technology, which sits on the highest point in Hoboken – a hill that overlooks the Hudson River and New York City. Rebecca & Dan have been married for five years now and are pretty perfect for each other. They support each other in their passion projects, are very loyal friends, and still manage to make time for each other despite their crazy schedules. In honor of their 1-year countdown starting TODAY (! ), here's a feature of Meagan and Mark's magical Mile Square engagement session. We visited three different locations in Hoboken and captured some super sweet moments between these two. On Friday, April 20th, 2018, my best friend and love of my life asked me to marry him. 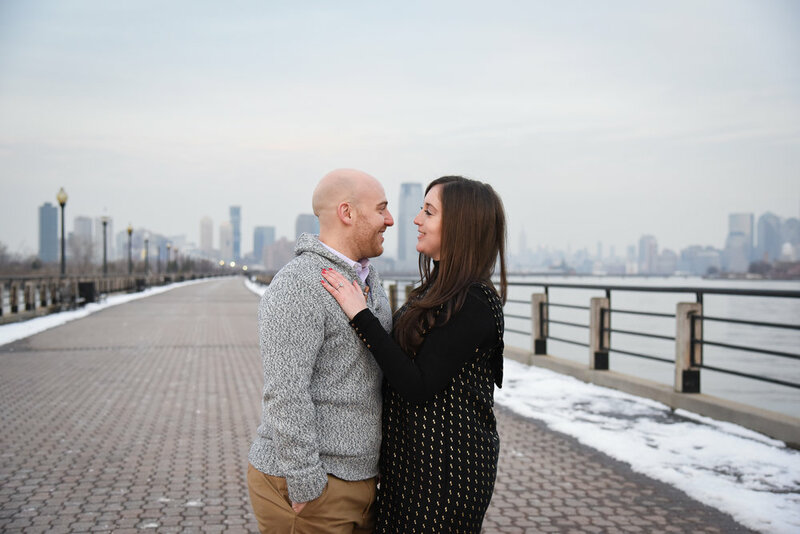 He popped the question on a beautiful spring evening on Pier A in Hoboken, one of our favorite spots in the Mile Square City, as the sun set and sparkled against the Manhattan skyline. 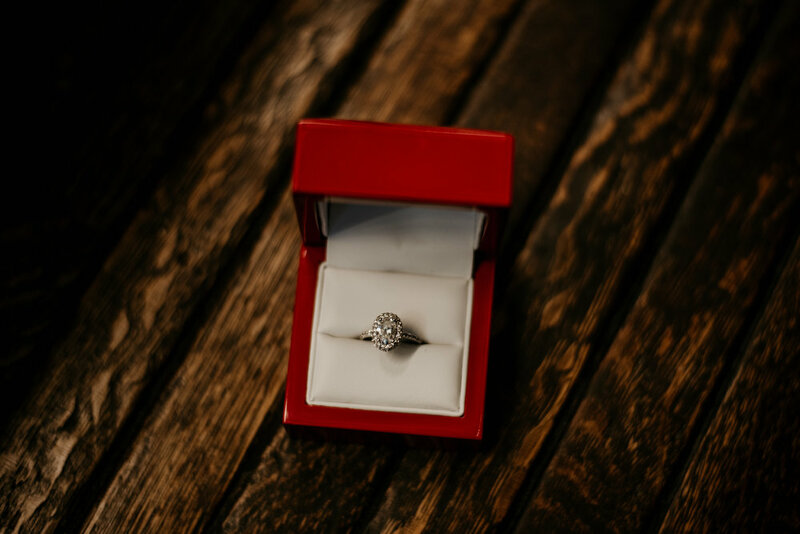 It was a dream – I felt like I was floating as he said some the sweetest words to me, knelt down on one knee, and asked me to spend forever with him. I managed to say ‘yes!’ through streams of joyful tears. I spent this past weekend back in my childhood hometown of Cresson, PA, to spend time with family and escape the concrete jungle. It’s so calm and quiet there compared to the Mile Square City. Cresson sits 2,000 feet above sea level, so it’s always significantly colder than the surrounding towns. The ground was dusted with snow and the air was brisk. I spent a fair amount of time sitting at the kitchen table, catching up on some editing work while looking out over the snowy backyard lined with evergreen trees. Laura and Troy met during placement testing before their first semester at Penn State. This might not sound so romantic, but they literally crossed paths on their very first day on campus together, which was the start of four incredibly special years during which they’d become close friends, make lifelong memories, and set the foundation of their forever…little did they know at the time. 2017 was a year of many firsts. It was the founding year of Mile Square Moments, and it's been such a blessing to watch it grow over the past several months. I've found so much meaning in telling the stories of the Mile Square City and surrounding areas of NYC & Jersey City, and I can't wait to see what stories 2018 holds. Thank you to all of my clients, for inviting me to be a part of your stories and special moments. It was an amazing year! Abby & Kenny were dating for almost three years in Hoboken/Jersey City when Kenny popped the question this past October. They'll tie the knot on New Year's Eve 2018! They now call Jersey City home, so we shot some engagement photos on a wonderfully wintery afternoon in Liberty State Park with sweeping views of the NYC skyline and the Statue of Liberty. Keep reading to see more photos and learn more about this fun couple. New Year's Eve can be emotionally confusing -- reflecting on all that's transpired in the past year while looking ahead to what's to come in the year ahead. For Mandy & Mike, 2018 will be very special because they'll celebrate their wedding exactly one year from today during the New Year's holiday. We did a fun New Year's themed 'Save the Date' shoot in Hoboken. It's clear Mandy & Mike have a ton of fun together and can't wait to start this next chapter of their lives. Keep reading to learn more about them and what they love about the Mile Square City. Jess and Brandon have a magical Mile Square story. They met at 10th & Willow, a Hoboken staple, and bonded over their mutual love for Boston sports. Eventually, they started dating and discovered they were next door neighbors on Willow Avenue -- destiny! And so ensued their Hoboken romance, which eventually led to their forever. I took the week leading up to my 26th birthday to camp/backpack through the Pacific Northwest with my sister Danelle and best friend Laura. We planned the trip around the August 21st solar eclipse. The path of totality ran across the US from the northwest to the southeast, so we wanted a front row seat to watch the moon totally eclipse the sun in Oregon. On Saturday, August 12, 2017, my cousin married her dream guy. It was a lovely summer day at a winery in Cambridge, WI. Blue skies filled with cumulous clouds hung over rows of grape vines, which made a beautiful backdrop for a wedding ceremony. What made this day extra special for me was that I wasn’t there as just a guest, but as her wedding photographer. 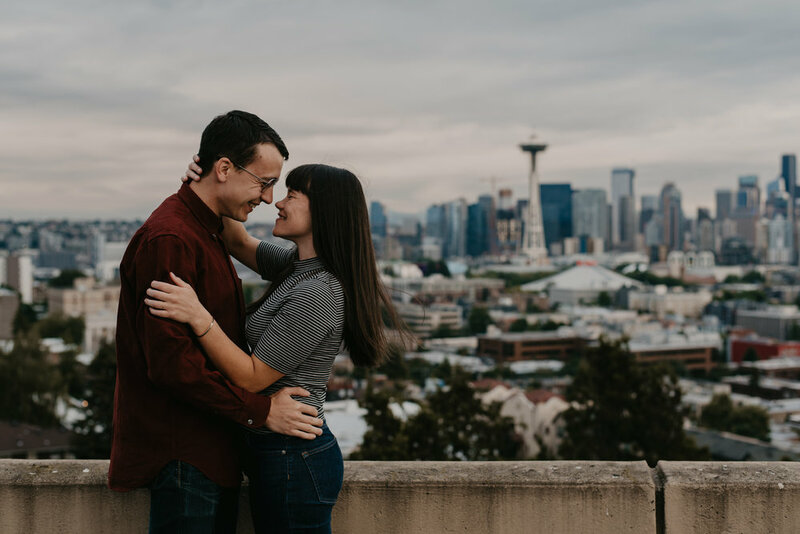 Rachel and Jon are a couple made in the Mile Square City, and their engagement session reflects this. 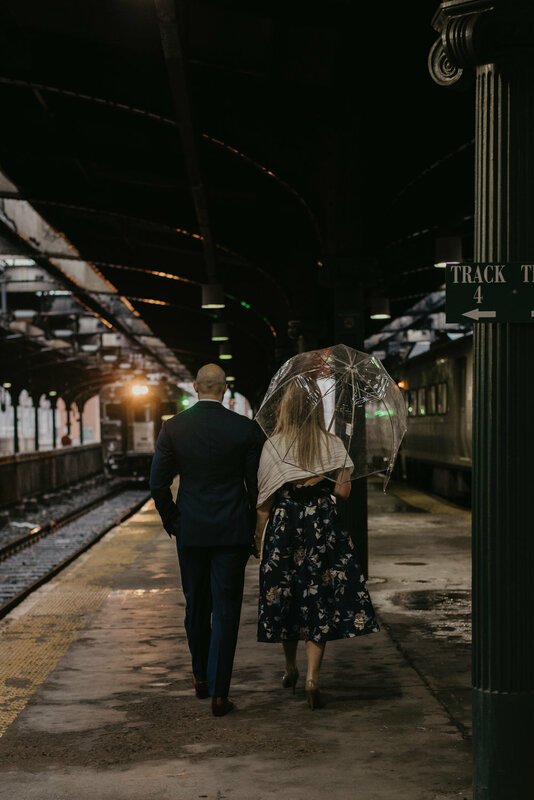 On a beautiful July evening, we hopped around Hoboken to some special spots, including Johnny Pepperoni's and Del Frisco's Grille, where they had some of their first dates. It was so fun to recreate some of these memories they shared early in their relationship in order to capture some incredibly sweet and happy engagement photos.